Do the Coyotes have two starting goaltenders? 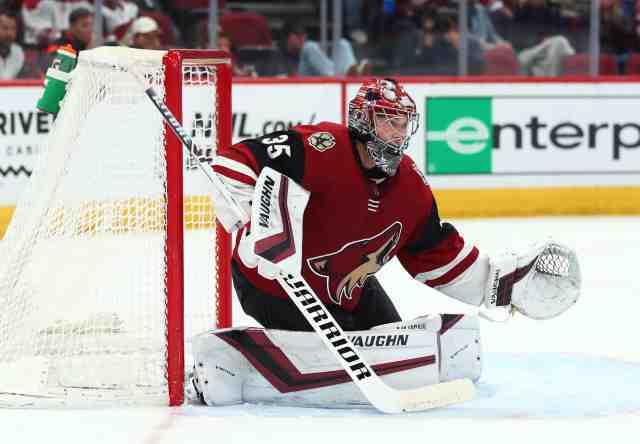 Matt Layman of Arizona Sports: Darcy Kuemper filled in for injured Antti Raanta this season getting in a career-high 55 games with a .925 save percentage. Do the Arizona Coyotes now have two starting goalies for next season? The New York Islanders ran with two starters this year with excellent results. Some think that the Coyotes should trade one of them, but it doesn’t sound like the road they want to head down right now. Raanta has been injured the past two seasons and has only played in 58 games. The Coyotes could look at trading Raanta but his value isn’t high, Kuemper has only started for one season, Raanta posted a .930 save percentage a year ago, and there is the chance that Kuemper could get hurt. Kuemper would be a free agent after next season. Craig Morgan of The Athletic: (mailbag) Can’t see the Arizona Coyotes being interested in Jeff Carter because of his cap hit, declining production and he doesn’t fit their model. With their 14th overall pick, they will likely be looking to add a scoring forward. Potential players who could be available in that range include Peyton Krebs, Arthur Kaliyev, Ryan Suzuki, Cole Caufield, Alex Newhook and Raphaël Lavoie. If someone offered a scoring winger for their first-round pick, it might be something they would consider. GM John Chayka has traded their first-round pick in the past – 2017. Unrestricted free agents they might be interested in if the price isn’t too high include Ryan Dzingel, Brock Nelson, Anders Lee and Jordan Eberle. Don’t think that Mats Zuccarello fits into the Coyotes plan as he’ll be 32 years old next season. Artemi Panarin and Jeff Skinner are likely too expensive for the Coyotes. Don’t believe the Coyotes are interested in Hurricanes unsigned prospect Adam Fox. Don’t think the Coyotes would trade goaltender Darcy Kuemper. If someone was to overpay then they may consider.